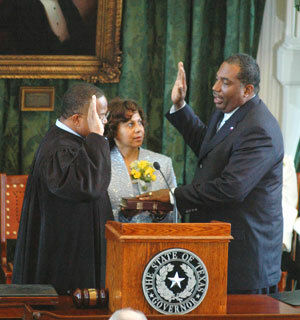 Continuing a 50-year Senate tradition, President Pro Tempore Royce West of Dallas was sworn in as Governor for a Day. The Texas Constitution states that whenever the Governor and Lt. Governor are out of the state at the same time or are otherwise unable to serve in their official capacity, the President Pro Tem assumes the duties of the Governor. By custom, once during each President Pro Tem's tenure, both top officials leave the state to allow a day where the Senator is honored for his or her services to the state and district. 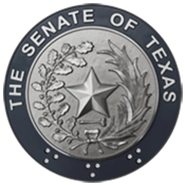 West was elected to represent his Dallas district in 1992, and has had a distinguished Senate career, being named to Texas Monthly's Top Ten Legislators list once and twice receiving an Honorable mention. He chairs the Senate Intergovernmental Relations Committee, and sits on the Finance, Education, Health and Human Services, and Jurisprudence committees, among others. He is a noted champion of the state's top ten percent rule, which guarantees admission to a state school for high school seniors graduating in the top ten percent of their class. West also brought the Unversity of North Texas at Dallas to his area, increasing educational opportunities for Texas residents. He has been instrumental in reforms to the Education code, Welfare and Tort laws, as well as the principle author of the Texas Juvenile Justice Code. 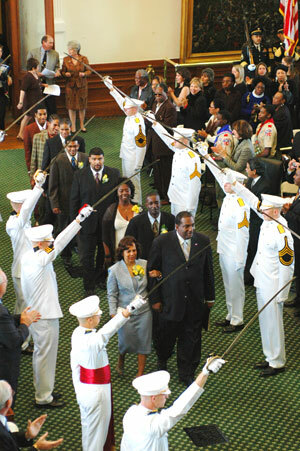 Governor West began the day with a parade down Austin's Congress Avenue, which started at the historic Congress Avenue Bridge, and ended at the State Capitol. 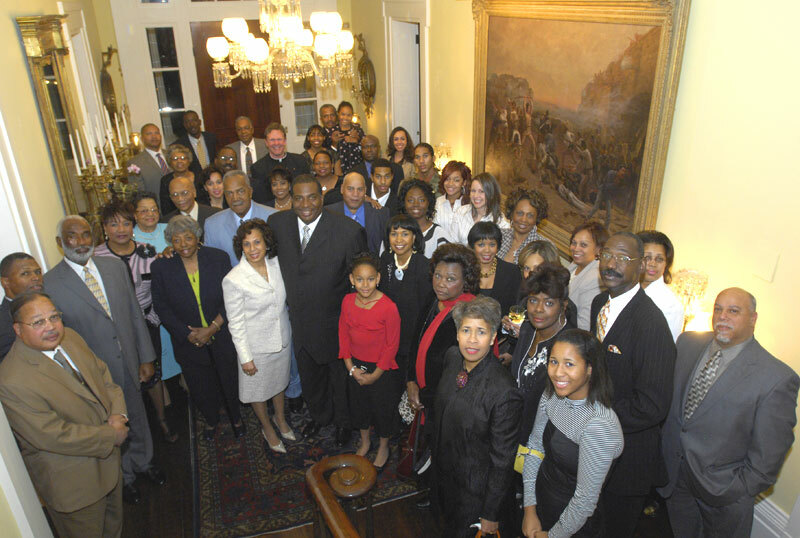 West was then honored with a ceremony in the Senate Chamber, where he was praised by his Senate and House colleagues. 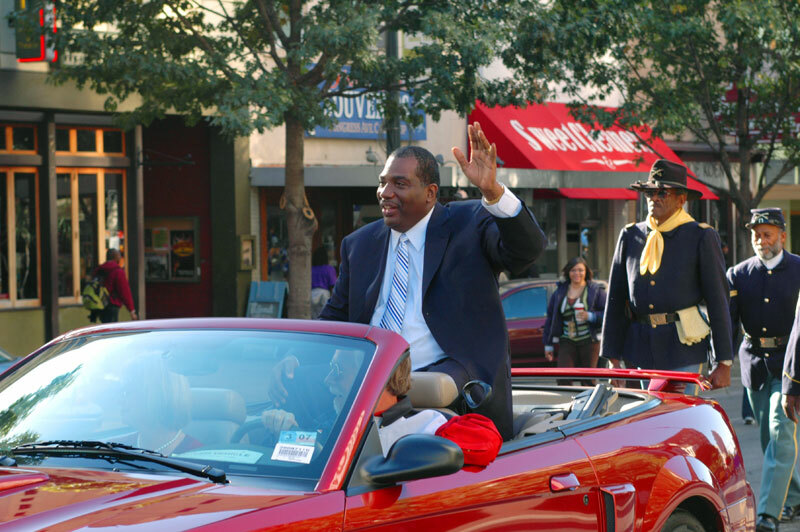 "While Governor West will be the first to disavow the notion that he alone is responsible for the accolades of this day, yet the evidence is overwhelming that his hard work, dedication to duty, accepting of responsibility, and visionary leadership is responsible for all the accolades that are due on this occasion," said State Representative Jesse Jones of Dallas. "Royce West is a man who uses his commanding prescence in the Texas Senate to pass legislation that is helpful, and to kill legislation that harmful," said Senator Judith Zaffirini of Laredo. "We know so well that he fights day and night to do what is right and to make wrong things right and that is the hallmark of the character of this man with high integrity, high honesty, the highest ethics, Governor Royce West." 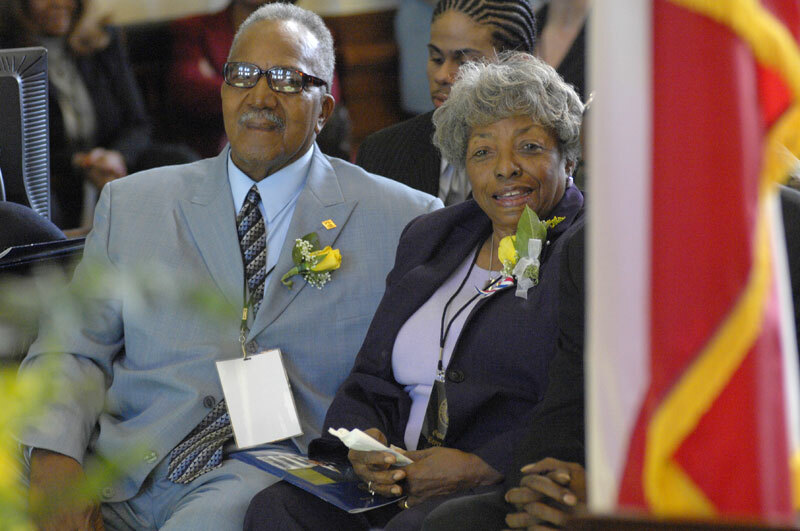 While this occasion is largely ceremonial, Governor West used the opportunity of his inaugural address to bring to attention the issues of criminal justice, education, access to health care and poverty. He pointed out that the state, which is predicted to have a multiple billion dollar surplus next biennium, should put that money where it is needed most: in better education, better drug and crime prevention programs, and increased health coverage, especially for children. He ended his speech with a ceremonial proclamation aimed at energizing the Legislature to concentrate on these issues. "Therefore let it be proclaimed that I Royce West, Governor of the State of Texas do order that it should be the number one priority of the State of Texas to prepare the next generation of Texans, our future leaders and the future of our state, by improving access to quality health care, to a quality education, and the quality of life that comes from enhanced economic opportunity," he said. Following the ceremony, guests were invited to the Capitol Grounds for food and entertainment. 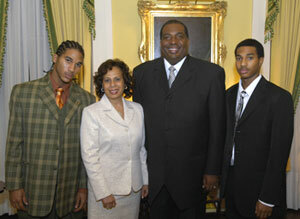 Governor West was joined at the ceremony by his wife Carol and his seven children. West is a partner in the law firm of West & Associates and is an active member of his community, serving as a Deacon in the Good Street Baptist Church.